The Purple Knights pose on the court; Harold Sylvester is kneeling next to his coach. It’s the last practice of the season for the Jesuit High School basketball team. They run in blue and white shirts up and down the court. 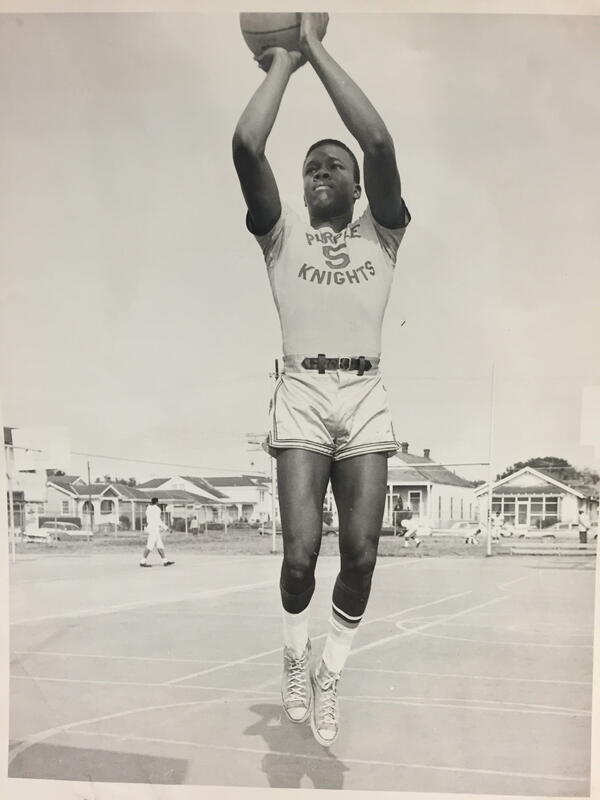 “We played it at the Jesuit gym, right there on Carrollton Avenue,” says Harold Sylvester, remembering what it was like walking into that gym for the first, and only time. Sylvester was a star of his team, but it wasn’t Jesuit. 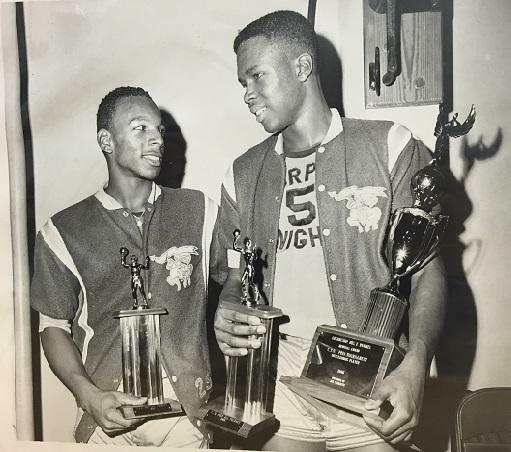 He was a Purple Knight for St. Augustine High School, or St. Aug.
Harold Sylvester (right) with a St. Augustine Purple Knight teammate. Goodier is now a partner at the Jones Walker law firm, and has been there practically since he graduated college. He’s lived in New Orleans his whole life, and grew up in the Bayou St. John neighborhood on Taft Place. He went to Holy Rosary grammar school, and then on to Jesuit, a private Catholic school. Sylvester’s St. Aug was private and Catholic too, one of only two black private schools in the city. He grew up in the adjacent Calliope housing projects, which has now become the Benjamin C. Cooper homes. “So, it was that kind of upbringing,” he says. 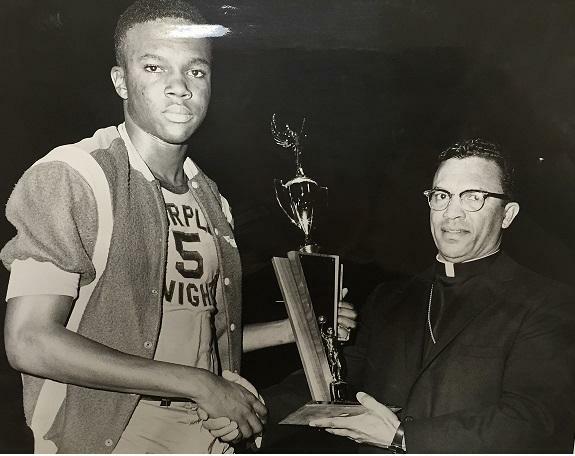 So both guys were playing ball in 1965, just when New Orleans private schools desegregated, but the city’s high school sports leagues were still segregated. That’s despite the National Basketball Association integrating several years before. So Jesuit didn’t play St. Aug. But they were the two top teams in the city. Efforts to integrate the leagues, including lawsuits, had failed. Jesuit's Glenn Goodier, in his Loyola days. “What I learned later on was that the president of Jesuit High School got together with the president of St. Aug and they wanted to show the Louisiana High School Athletic Association that black and white teams could play one another without there being any problems involved,” remembers Goodier. The coaches worked behind the scenes to pair the two teams against each other. They decided on a secret match on Jesuit turf. But Sylvester says the motive wasn’t explained to the players at the time. What’s interesting is that, up until this point in the story, Goodier and Sylvester remember things almost identically. But after hearing the announcement about the game from their respective coaches, their memories and experiences of this shared moment stray. Goodier remembers hearing this news, and not thinking much of it. To Goodier, this was just another thing his coach was asking him to do. And it wasn’t part of the “official” season. But for Sylvester and his team, it counted. Harold Sylvester takes a jump shot in his St. Aug uniform. The two men also have very different experiences sharing this news with their parents. Goodier says, again, it was a non-issue. Not so simple with St. Aug. Many parents saw playing Jesuit as something that could put their children in danger. And they had reason. It’s understandable that Sylvester’s parents wouldn’t want to put him in that position of being a target again. But that was the difference between these Purple Knights and their families. Members of the Jesuit team today. 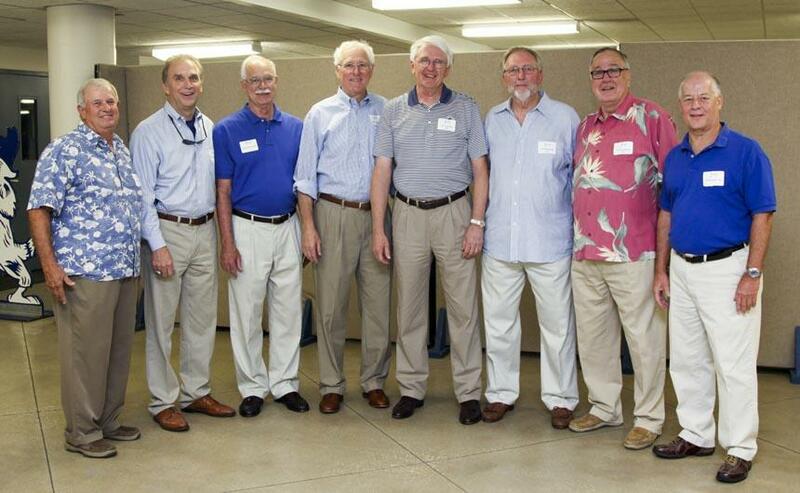 From left, Ronnie Britsch, Tommy Morel, John Carrere, Billy Fitzgerald, Glenn Goodier, Joe Williamson, Art Hamburger and Drew Gates. Some players on both teams were barred by their parents from playing, but most did, including Sylvester and Goodier. They paint different pictures of game day. Goodier says families weren’t in the stands. “No one in the stands at all, the gym was locked, so only people that were there were coaches but other than that no parents, no anyone else,” he says. Sylvester remembers a limited audience. And they remember the outcome differently. Goodier says there was no clock kept for score, and five untimed quarters. “We actually beat them by 22 points”, Sylvester says, laughing. Harold Sylvester poses with trophy and Bishop Harold R. Perry, the first African-American bishop in the 20th Century. The game was on February 25, 1965, which is another curiosity, Sylvester says. And there’s a victorious moment when the Purple Knights win, yet it must have been awkward, too. Right, Sylvester affirms. And no bragging rights around town. The game stayed a secret for a few months before the coaches told the papers. And that was the beginning of desegregating local high school sports. By 1967 when the leagues were fully integrated, Sylvester and Goodier were playing in college -- Goodier for Loyola, Sylvester for Tulane. He went on to a life in Hollywood, and made a movie about the game called Passing Glory. TriPod is a production of WWNO — New Orleans Public Radio, in collaboration with the Historic New Orleans Collection and the University of New Orleans Midlo Center for New Orleans Studies. TriPod goes back to the days when Algiers was a stomping ground for bullfights and other forms of animal combat. It’s a Sunday afternoon. The sun is out, you’ve already gone to church, and you’re not sure what to do next. Then you find out the ferry to cross the river to Algiers is running at half rate, on account of a sporting event. A fight. Between a bull. And a grizzly bear. When you think about gymnastics — parallel bars, the pommel horse, ropes — what else pops into your head? Fighting Napoleon and frosted beer mugs? Me too! Here's how the Germans brought gymnastics to New Orleans.